Commissioned by the United States Department of the Treasury, Haskell Coffin created this poster in 1918. Feeding off the popularization of Joan of Arc in American culture, Haskell uses the imagine of Joan of Arc to encourage women to buy War Savings Stamps in order to save their country, much as Joan of Arc saved France. In 1909, Joan of Arc underwent a beautification. Cecil B. DeMille’s 1916 film Joan the Woman had so much press coverage that Joan became a household name in the United States. Joan’s canonization at the time also seemed inevitable. American women were quite familiar with Joan and her story by the time World War I started; and so she became a popular imagine to use in propaganda posters. Haskell’s use of a rich blue background and the sheer size of this poster (102 cm x 76 cm) would make this poster easy to spot on any building. Known for his renderings of beautiful women, Haskell’s art graced the covers of numerous popular magazines including Redbook, The Saturday Evening Post, McCall’s Magazine, and The American Magazine. Haskell portrays Joan as a beautiful young woman, who is raising her sword high to protect her country. 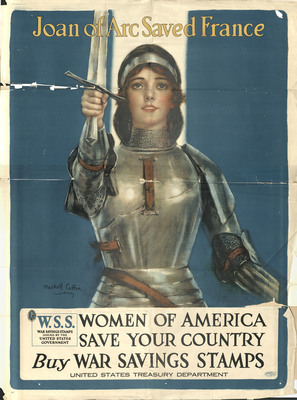 The poster suggests that like raising one’s sword, buying War Savings Stamps will affect the outcome of World War I much as Joan of Arc’s heroic fighting impacted the Hundred Years War. Because War Savings Stamps were inexpensive, it was easy for women to be able to afford them, and overtime fill a booklet to transform them in a war bond. Over the course of the war these stamps as well as war bonds raised approximately two thirds of the cost of World War I.
Powell, Nicole, "Joan of Arc Saved France" (2014). World War I Poster Project. 1.